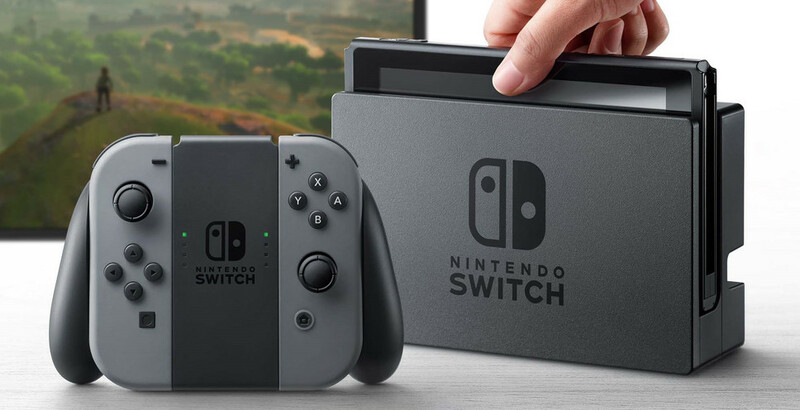 The Switch will release in most territories on March 3 for US$299 (NZ$420 / AU$399), Nintendo announced today. The Legend of Zelda: The Breath of the Wild is a launch title. Switch comes with a console, a left and right Joy Con controller (two grey, or one red and one blue), wrist straps, a Joy-Con grip, the Switch stock, an HDMI cable, and an AC adapter. A Pro Controller will also be available separately. For reference, the Wii U cost US$350 at launch for its deluxe edition, and the Wii cost US$250. The system's portability aside, the Joy Con controller is its big point of difference. It features an accelerometer, gyro, high-definition rumble, near-field communications (NFC) reader and writer for Amiibo, and a motion IR sensor that can sense how far away objects are and can detect hand shapes like rock, paper, and scissors. It can also be split into two (left and right). Each half has four ABXY buttons, a joystick, and shoulder buttons. One half has a home button, and the other has a capture button and IR sensor. Both sides feature rumble and NFC. Nintendo will launch a new premium online service that you can access from your phone as well as the Switch. It allows you to start online matches, send friend requests, and boot up a multiplayer. It is free to try, and will be a paid service from spring 2017. More details are coming later. Up to eight Switch systems can connect for local wireless gaming via Wi-Fi. The Switch will not be region locked. It features screenshot functionality, and the ability to record gameplay is in the pipeline. Its battery life varies by game, but is generally 2.5–6.5 hours, and it has a capacitive touch screen. ◆ 1 2 Switch is a motion-controlled multiplayer game where you look at your opponent rather than a screen. ◆ Arms is a fighting sports game where players use extendable arms to battle. According to Nintendo, it's like boxing, but also like shooting: you aim and fire at distant opponents, curve punches by twisting your fist, and so forth. There is a low barrier to entry, but a high level techniques and strategies to learn and you can play local or online multiplayer. It's due out this autumn. ◆ Splatoon 2 introduces new weapons and maps, and as with the first, you can use gyro to aim and stage and weapon updates and in-game events will be free after launch. It's coming this winter. ◆ Super Mario Odyssey is the next big 3D Mario game. It looks like Peach is once again kidnapped by Bowser, but now Mario has a sentient cap that he can throw then use as a platform to jump off of. It coming at the end of the year. Also announced as on the way: Mario Kart 8 Deluxe, Xenoblade Chronicles 2, Fire Emblem Warriors, a new Shin Megami Tensei and Square Enix RPG, Dragon Quest Heroes 1 and 2, The Elder Scrolls V: Skyrim, FIFA, Skylanders Imaginators, and a Suda51 game featuring No More Heroes' Travis Touchdown and heavily influenced by pro wrestling. Nintendo finished up its press conference with a sizzle reel that included what appeared to be: Minecraft, a Dragon Ball Z game, I Am Setsuna, Minecraft: Story Mode, a Sonic game, Just Dance, Street Fighter, NBA 2K, Farming Simulator, Project Octopath Traveler, Rayman Legends, and Has Been Heroes.